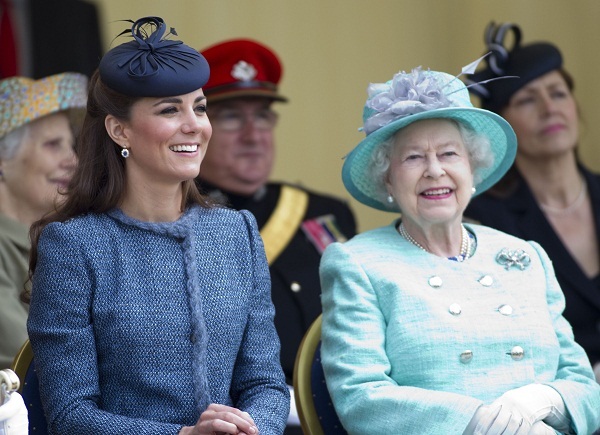 Kate Middleton will be honored by Queen Elizabeth II in October. The Duchess of Cambridge will receive The Royal Family Order of Queen Elizabeth II at a state dinner; the highest honor that can be bestowed upon a female member of the royal family. The order is a small diamond-framed badge painted with a portrait of the queen, which is hung from a yellow ribbon and worn at state functions. The giving of such orders was started 200 years ago by King George lV and is basically like getting a gold star from the monarch. So the queen clearly believes that Kate has done a sterling job of representing the royal family in her first four years of marriage. It is a private honor though, so the news will not be made public. Look out for a very special new piece of jewelry on her.